The webshop opens on 1st April. It still unclear as to what will happen with Brexit. We at Pitcairn Alpines are taking orders as usual but are unable to predict future trading arrangements. So for those European customers who are purchasing this year we would like to treat them fairly. If subsequently as result of Brexit our trading arrangements and costs have to change we will notify you of any additional charges and give you the option of continuing or cancelling your order. If you wish to cancel your order we will refund your money. I hope this is agreeable to all our customers that maybe affected. Welcome to Pitcairn Alpines. Please browse around and either order online or send a paper order to the address on the contact page. 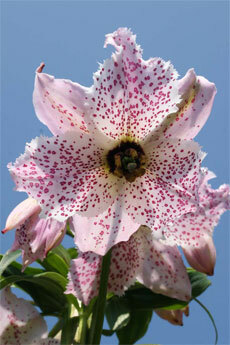 All the bulbs are grown by ourselves and should be of flowering size unless stated. We are able to take online credit card payments, Paypal or if you prefer you can order online and then send in a cheque, details are given at the checkout . If there is anything you are not sure about send an email with your enquiry or give us a phone. Here you will find the full list of our bulbs. Due to high demand and wishing to be fair to all our customers we are offering the following speciality plants on a restricted number basis. You will be able to order a maximum of 2 plants per species from this category. We apologise for this inconvenience but these plants are slow to propagate and multiply to sufficient numbers. A selection of seed raised Lilium species both from the USA and China. These will be dispatched in September but can be ordered from April. New to growing rare bulbs? In this this section I have chosen a variety of the easier species in each family to grow in the open garden.